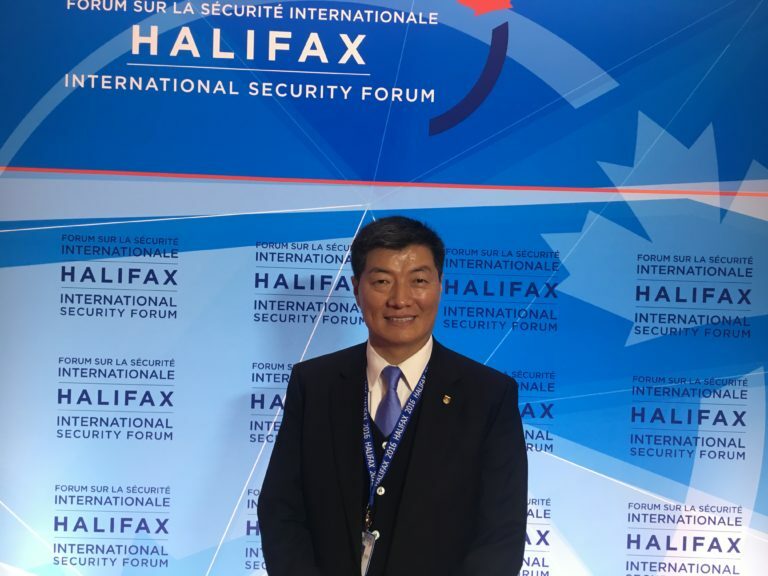 (TibetanReview.net, Nov21, 2017) – The President of the Central Tibetan Administration at Dharamshala, Sikyong Lobsang Sangay, was reported to have spoken at the 9th annual Halifax International Security Forum in Canada which concluded on Nov 20. Speaking at the forum’s panel on ‘India-China Relations’, he was reported to have described Tibet as the core issue in India-China relations, given its significance as Asia’s water tower and the 3500 km border Tibet shares with India. He was stated to have called for the restoration of Tibet’s historical status as a buffer zone between the two Asian giants. His co-panelists were Dr Alyssa Ayres, Senior Fellow for India, Pakistan, and South Asia at the Council on Foreign Relations; Ambassador Husain Haqqani, Director and Senior Fellow at the South and Central Asia, Hudson Institute; and Dr Daniel Twining, President of International Republican Institute. The 90-minute session was moderated by Dr Carla Robbins, Adjunct Senior Fellow at the Council on Foreign Relations. More than 300 participants from 80 countries were reported to have attended this year’s forum. The Forum is organized by Canada’s Ministry of National Defense and it was led this year by the country’s Defence Minister Harjit Sajjan. This was Sikyong Sangay’s fourth year of participating in the forum which is said to be North America’s leading foreign affairs and defence conference, bringing together government officials in the forefront of decision-making and policy formulation impacting the global political discourse, besides media persons and scholars.